Customized white, red & navy blue 64” arc golf auto open umbrellas can raise up the energy levels of any onlooker with their eye popping color combination. 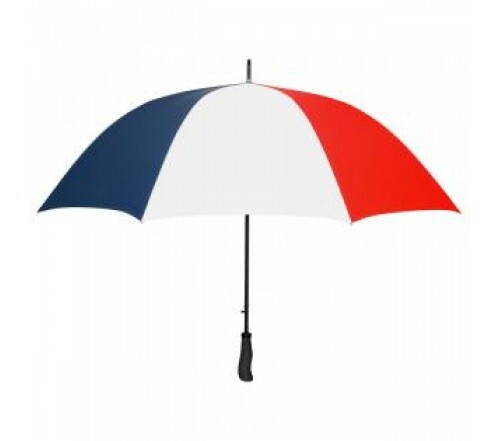 Logoed promotional white, red & navy blue 64” arc golf auto open umbrellas can be employed by businesses with creative interests such as fashion houses, salons, luxury lifestyle stores and many more to represent themselves in best light. Personalized white, red & navy blue 64” arc golf auto open umbrellas can be gifted away in controlled number to raise the festive sales or they can be loaned for the purpose of showcasing during promotional or social events. Imprint area - 10"W x 8"H.Dimensions 64” arc closes to 42.5”.